I am blown away by this Hazelnut cake recipe and I think you will be too. I made this for a friends wedding cake many moons ago, and it was a wow then. For some strange reason I have not made it since. Sure wish I had because It's amazing! 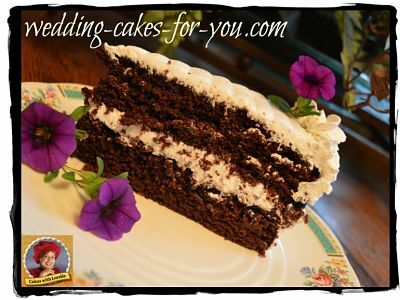 Whipped cream frosting was used for this tester cake, but of course you can choose many options from this website for filling and icing. Add a bit of Hazelnut flavored liqueur (Frangelica) to taste and press chopped toasted Hazelnuts into the finished cake. See more ideas below for flavor combo's. This will make two 9 or 10 inch layers or three 8 inch layers. Bake them for about 20-30 minutes or longer just until the cake springs back when lightly pressed in the center or when a toothpick stuck into the center of the cake comes out clean. NOTE: The hazelnut fudge recipe calls for the usual oven temperature of 350 degrees, I use a lower temperature in my oven. I have found that 350 is too high and my cakes burn around the edges and do not bake in the center. If this happens to you try lowering the temperature. Mine is set at 335 for most cakes. You will have to experiment with your own oven. The recipe yields 8 cups of batter. Method: Start by tossing together the flour, baking soda, salt and hazelnut meal. Set aside. Mix the cocoa and the boiling water to make a paste and set aside to cool. Add the eggs one at a time mixing on medium speed after each addition until blended in. Add the vanilla and the cocoa paste. Final step is to alternately add the flour mixture and the buttermilk in three additions beginning and ending with flour. Your Hazelnut Fudge Cake batter is ready for your pans. Split the batter between the pans. Bake until the cakes spring back to the touch or a toothpick stuck into the center comes out clean. 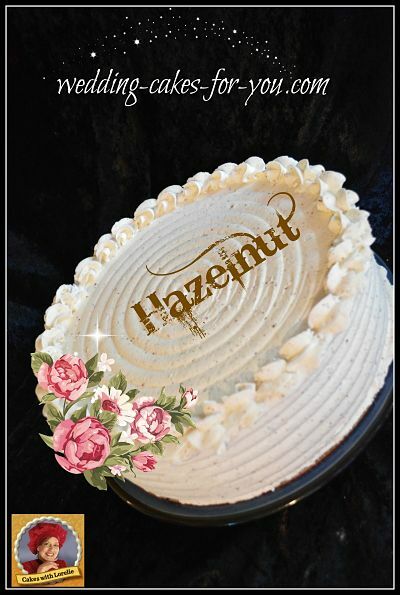 Enjoy this delicious Hazelnut Cake Recipe! Whipped cream with confectioner's sugar to taste and Hazelnut meal makes a wonderful filling and frosting for this cake. If you were going to use it for a wedding cake I would suggest using buttercream, ganache or chocolate mousse. The cake is very subtle and light so a lighter meringue buttercream would go very well as a filling and frosting.